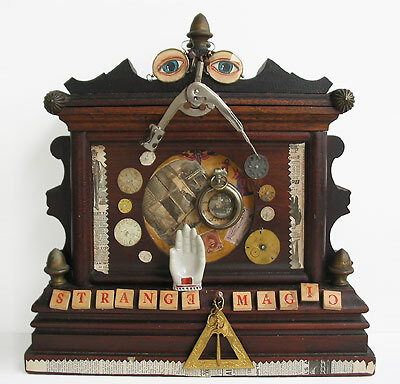 This piece of assemblage art portrays the fascination many of us have for superstitions. I started with the clock case which I found was signed on the inside perhaps by a husband to his wife. I painted the eyes and placed them in the old spectacles to look down upon all the found objects: watch parts, game pieces old photos, ephemera and such. This piece has a compartment in back containing good luck charms-for those who believe in that sort of thing!